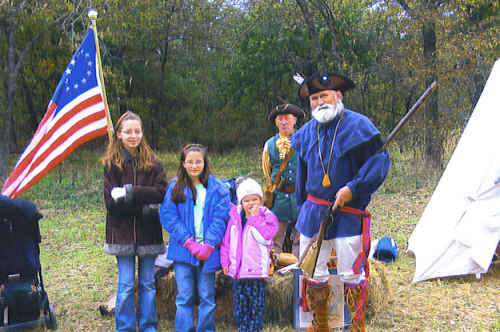 The MOSSAR Color Guard Team participated on Saturday, October 17th, 2009, at the Nathan Boone Homestead, located in Boonsville, MO, where they honored Nathan Boone by talking to children and parents about early frontier life. Early Missourians knew Nathan Boone as a hunter, soldier, surveyor and entrepreneur. They also knew him as his father's son. 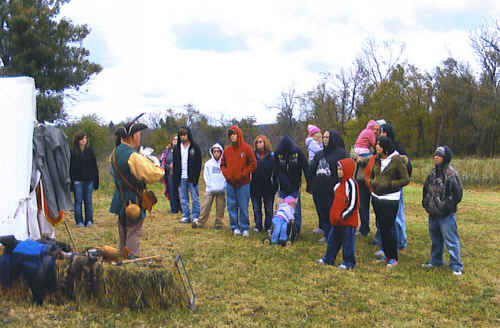 Boone, youngest child of the famous Daniel Boone, carried his family's legacy deep into the Missouri Ozarks and the American West. Left Photo: Compatriot Frank Shouse. Right Photo (L-R): Compatriot Frank Shouse and Compatriot Francis R. Roberson, Jr.